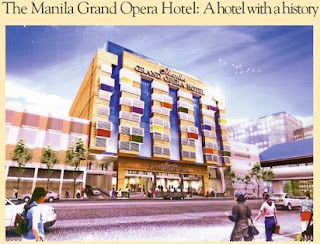 A NEW hotel is opening on the site of the Manila Grand Opera House, known for many years as “the theater with a history,” where the most famous opera, concert, vaudeville and zarzuela artists entertained theater art lovers from the mid-1800s to the early 1950s. The hotel, located at the corner of Rizal Avenue and Doroteo Jose Streets in Santa Cruz, Manila, is named Manila Grand Opera Hotel after the historic theater. Lawrence Tan, general manager, said the hotel will awaken popular interest in the country’s cultural legacy and serve as a reminder for all, particularly the young, that the greatest Filipino artists of the Spanish and American times entertained the masses at the historic theater. Besides hosting cultural presentations, the Manila Grand Opera House also served as the venue of the inauguration of the First Philippine Assembly on October 16, 1907, by United States Secretary of War William Howard Taft. A historical and cultural corner at the lobby of the hotel will showcase mementoes and memorabilia, photographs and news clippings telling of the famous events that happened and personalities who performed in the historic theater. Among these are a group picture of the First Philippine Assembly and individual photos of the artists who performed in the theater, such as Atang de la Rama, the comedians Pugo and Togo, Tugak and Pugak, Patsy, Lupito, Canuplin and many other Philippine theater greats. Masama Ugali ng mga may ari dito, sila amba cabangon chua at mga anak nya like edgard. pag may topak nag aalis at nag tatanggal lang basta basta ng tao. dapat maipa labor mga yan kaso lang nga mga maimpluensya mga taong ito, siguradong pera lang ang pagagalawin tapos ang kaso. injustice ang mangyayari!!!!! blog owner please approved this so people may know what's happening internally specially how they treat their staff.